In our increasingly digitized world, the Internet has an unprecedented place in any business endeavor. NAI Global knows how important a strong social media presence is in helping our affiliates expand their business. 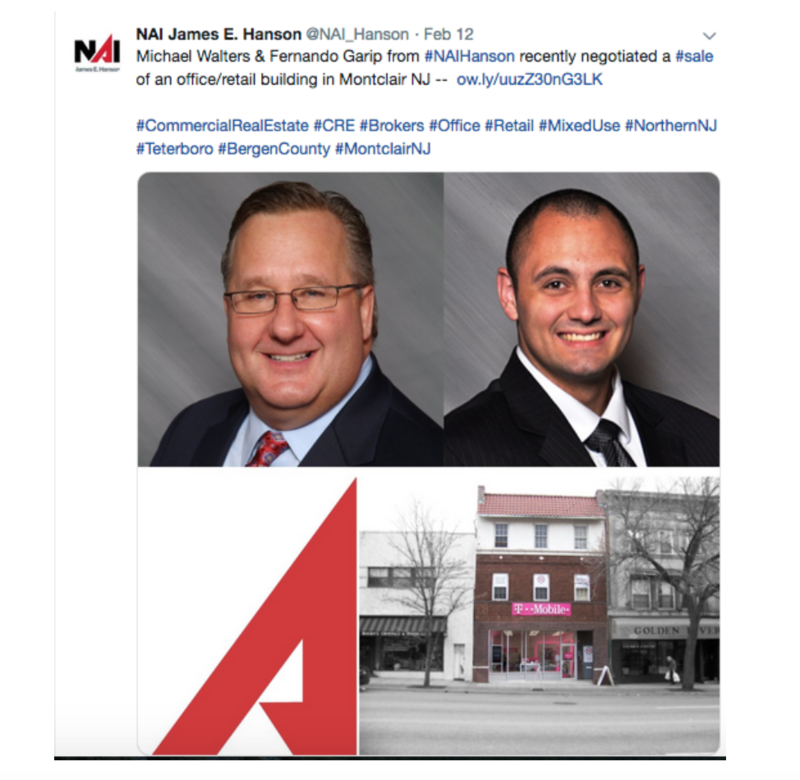 While the NAI team is dominating the CRE industry, NAI Global offices are also setting up this year’s hottest trends on Twitter. Follow their example to get in on the best engaging practices and tricks to gain more followers in 2019. There’s no reason why every day can’t be something to celebrate. Everyone can learn a thing or two from NAI Elite’s unbeatable hashtag game, which acts as a trendsetter in and of itself. NAI Elite creatively comes up with a catchy hashtag for the different days of the week and posts relevant content under that introduction. This is playful, attractive, and really engages with followers. Whether it’s #MultifamilyMonday, #DealOfTheDay, or #RetailTuesday; followers are crazy about this trend. Based out of New Jersey, this office knows how to show off their team members and accomplishments. Anytime something notable happens - be it a new listing, new team member, a closed deal, or a press highlight - NAI Hanson is documenting it. This is a great way to engage with the local audience and show them all the latest achievements. A grounded support system is the best way to gain repute in 2019. Urgency always calls attention, and NAI Capital knows exactly how to gain this appeal. Sharing news and stats can easily be boring and end up getting scrolled past, so what’s the best way to make it pop? The answer is by translating it into the language of the Internet - emojis. NAI Capital uses fitting emojis and capitalized text to jump out at the reader, enticing them to explore the relevant CRE newsbreak. Follow their example to stand out and be heard. This South Carolina team knows a big secret about business-based social media - it needs to go beyond the industry. Although online audiences follow accounts to get the low-down on everything CRE, there needs to be some sort of friendliness involved. Show off amazing members with introductions and personal sharings that create a deeper connection with followers. The NAI Columbia team kills it by sending warm wishes during the holidays, documenting team celebrations, and posting about valued members. 2019 is looking for more personable engagement and less cut-and-dry interactions. There’s no better way to boost local following than by giving back to the community. The CRE business is strongly rooted in its local atmosphere, and it’s important to give back to what is fueling a team’s success. NAI PSP is consistently broadcasting their fundraisers and charity projects, which can attract potential donations as well as show the community how much their business cares. Toy drives, bake sales, and food collections are all everyday occurrences at NAI PSP - and they’ve made sure everyone knows it. Use these tips to boost your Twitter account this 2019. For more about how NAI Global’s rockstar offices use social media, click here. The expanded array of vehicles intrinsically tie into the sphere of CRE, as they require specific accommodations, storage, and parking facilities. The current trends and technologies affect the planning and development of modern multifamily, office, and retail sectors. This global enterprise is continuing to take the retail world by storm with their latest venture. With the opening of their first brick and mortar locations, Amazon has been looking for new venues to host their state-of-the-art AmazonGo stores. These cashier-less stores are providing the world’s most advanced shopping experience, with no lines or physical checkouts. 2018 was the year that the CRE world finally starting paying serious attention to co-working. With CRE moving into the flexible workspace industry, it continues to influence the way co-working office spaces operate. CRE’s redesigning of the business model can be observed on all fronts, especially negotiations and agreements. Get an insider's view by looking at these 3 major ways CRE is moving into co-working. The retail industry is seeing a definite shift in big retailers’ brick and mortar stores, as they continue to experiment with different store formats and models. Smaller footprint stores are also popping up among smaller brands that have, until now, played only in the online world. So, when it comes to physical space, why the shift from big to small, or from non-existent to small? The answers vary and often aren’t simple. Over the past several years, coworking has become more and more mainstream, with the idea of traditional office hours being replaced by remote work as companies are choosing to minimize their overhead while maximizing their flexibility and efficiency. In fact, the coworking market now how thousands of players, located all over the world and coworking operations are popping up left and right amidst startups and tech companies. And while there is plenty of buzz around financial technology, artificial intelligence, and virtual reality, coworking is a fast-growing subsector of the commercial real estate market that deserves some credit itself. Think about it -- real estate is an expense for nearly every business out there, whether that business is owning, managing, or leasing. Fortunately, artificial intelligence, or AI, offers a great opportunity to lower some of the costs traditionally associated with commercial real estate -- especially those that are associated with property management, but it doesn’t stop there. Artificial intelligence is also being used to automate a number of processes, allowing CRE professionals to work more efficiently. Another year has come to a close as we leave 2018 behind and usher in 2019. Your New Year resolution as a commercial real estate broker may be to close more deals this year. However, productivity is a key component in reaching this goal. If you focus on working smarter and ramping up productivity, you will be well on your way to the best year yet. Thinking about leasing an office space now or in the near future? It is important to consider a number of things prior to closing the deal. Of course, any business owner or professional in need of office space will look at the size and price of a variety of offices, but there are a number of additional details and features that might get overlooked when deciding on new office space. Developing a sense of community and providing your tenants with amenities in an office building, apartment complex, and everything in between is proven to make them feel more comfortable and valued. Tenants are also more likely to stick around and renew leases with an environment they enjoy. So, let’s take a look at some ways you can develop a sense of community for your tenants, t ensure their happiness and longevity in your property. We are all more than aware that office buildings are extremely prevalent in any modern cityscape. While larger office buildings are structures that normally stand the test of time, think Empire State Building —that doesn’t mean that they don’t need to be spruced up as we continue to evolve. While that may not mean a massive tear-down and rebuild, there are ways to update your office building to include amenities that your tenants will consider a must-have.